My story starts back in January (yes it is currently August) during a cold spell when I decided that my feet and legs would be very happy wearing a nice pair of boots to work for three days. No these boots do not have heels. No they have never given me problems before. No my feet didn’t feel particularly bad wearing them. But after going for a nice 3 mile run on day four I knew something was wrong with my left foot. Morton’s neuroma is classified as nerve irritation that causes scar tissue to form. 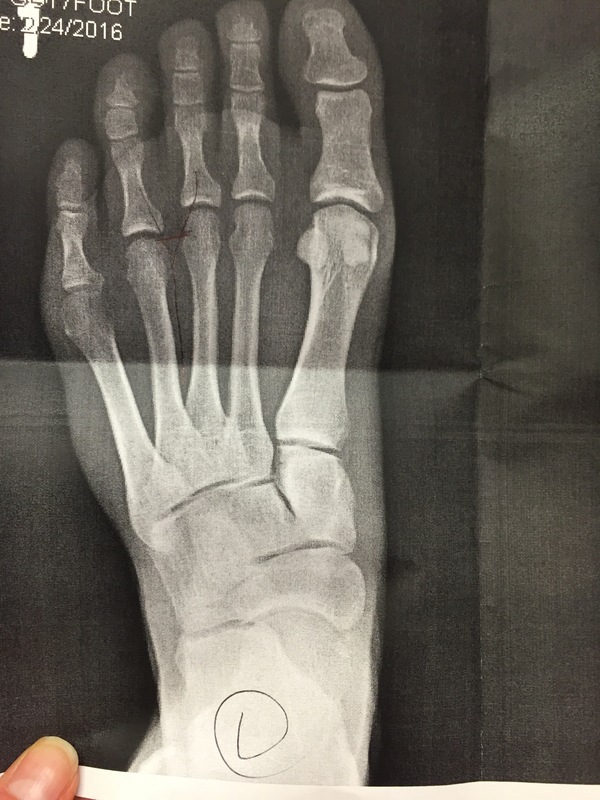 It is most common between the second and third metatarsals and the symptoms include a dull ache in the region, numbness or tingling in the toes, and pain with pressure. In some people the scar tissue builds up so much that surgery is needed to remove it. It can be caused by trauma, wearing ill-fitting shoes or high heels, and tight muscles in the feet and calves. Mine was definitely a mild case, as I wasn’t experiencing any numbness or tingling. There was just pain that would get worse with activity. I went to the orthopedist to make sure I didn’t have any fractures and his advice was to lay off all activity for a while. He didn’t seem to think anything of the fact that by the time I went to see him my foot had already been hurting for 6 weeks. He offered me a cortisone shot, which I declined, and said to give it another 6 weeks.Foot injuries are the worst. Feet are needed to do everything! – I bought a pair of Hoka tennis shoes for lots of cushioning. – I used KT tape for support when my feet were feeling tired. – I put some metatarsal pads in my shoes to open up the space between my toes when I walked. -I used lacrosse and golf balls to massage the bottoms of my feet. At this point, 8 months later, I can run in my Hokas, bike, and play ultimate frisbee for a weekend. My foot still gets sore if I sit cross-legged on it for too long or if I try on shoes that don’t fit quite right. Words of wisdom – get shoes that fit and have a wide enough toe box! If you think you may have a neuroma please seek a medical opinion, as I am not a qualified medical professional. This entry was posted in Uncategorized by mlwattsupp. Bookmark the permalink.